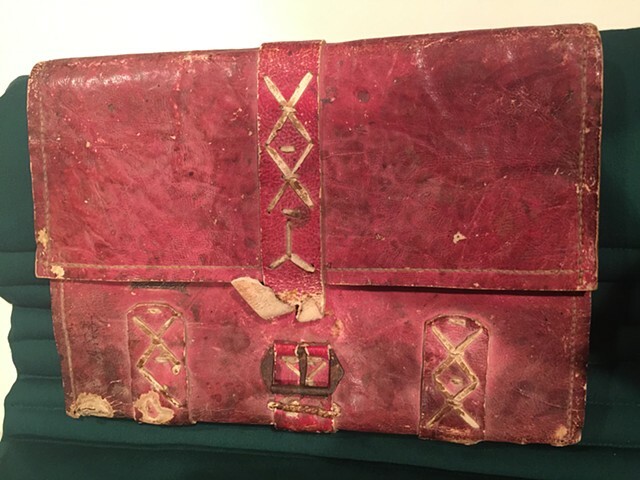 Ledger / Stationer’s binding owned by 14th century Florentine businessman, Pepo degli Albizzi. This model is based on both a specific exemplar found in the Newberry special collections. 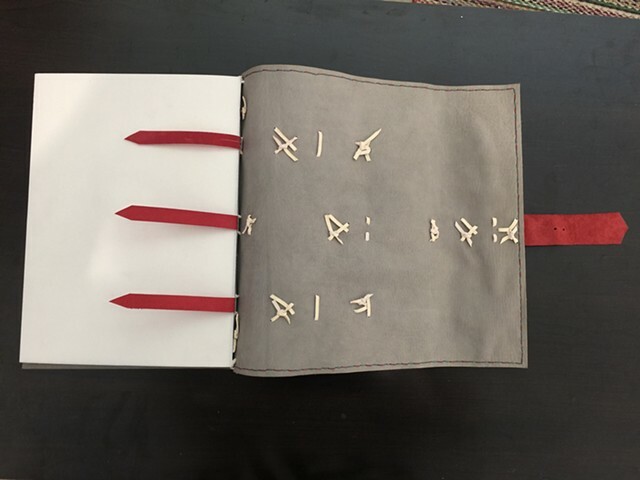 This book has a limp leather cover with decorative bands and a buckle. 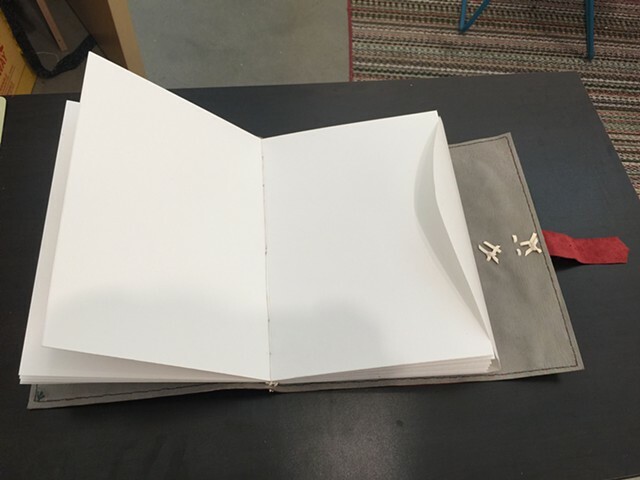 The bands help support the cover and the buckled flap allows for flexibility of expanding the thickness of the book as needed by the owner. The most common lacing pattern is the Saltire pattern. The textblock is attached with tackets and wrapped in a parchment envelope. The original textblock is made with parchment pages (Korbel). Stationary bindings were used for accounting information, business ledger, private record keeping, and personal diary accounts. Previous to stationary bindings, accountants and medieval businessmen recorded business matters on rolls. These were cumbersome to carry around and naturally a codex style book was introduced (Birch). Stationary bindings with laced overbands originated in Italy in the early 14th century. The Italians understood both function and aesthetics of the laced overbands-- these tacketed bands added support for materials within and protected the outer-cover. Carrying the book under one’s arm became a symbol of power and status-- the fashionable binding made its way to Northern Europe in the 15th century and remained in popular use through the 18th century. When the binding moved from Italy, the Northern bindings lost some of the structural integrity the Italian bands gave-- however, as a status symbol, the decorative bands did the trick for status (Bearman). These books were actively used and extra support material was left on the inside to add additional sections later on. 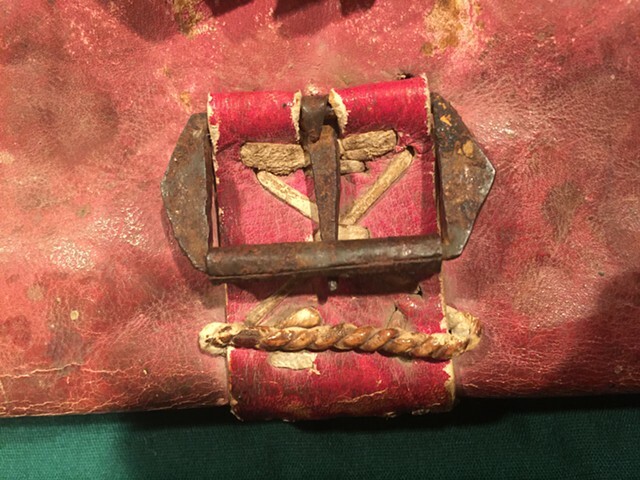 Albizzi’s ledger has a wraparound flap with a buckle attached to the center band-- the band has multiple holes giving the buckle flexibility if the thickness of the textblock changes during the course of its lifetime. 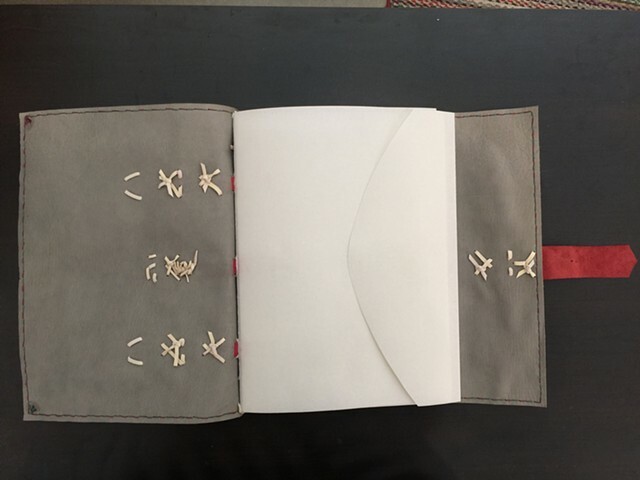 The buckle is also necessary since this particular textblock is made out of parchment and requires to be held firmly closed. Note: a majority of ledgers and stationary bindings were simple limp parchment books-- some had leather spine pieces tacketing the cover to the textblock (Medieval), others had a leather band wrapping the book with a buckle, and some just used alum tawed lace to tie the fore-edge closed (Birch). 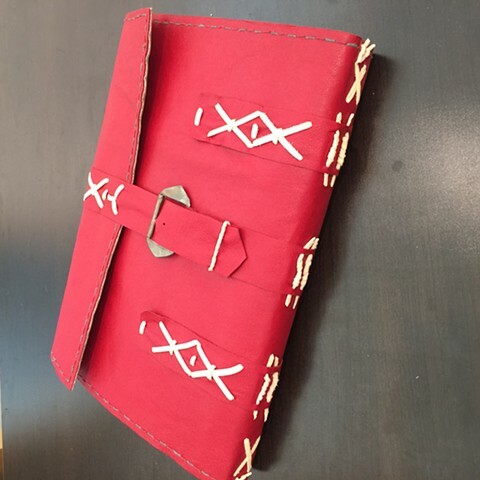 The stationary bindings that I’m researching are from highly wealthy families with laced overbands either sewn or tacketed to the cover-- these books typically upgraded from parchment covers to limp leather coverings (Bearman). -- The textblock is all-along packed sewing on dyed red alum tawed thongs wrapped in a synthetic parchment wrapper. Sewn on a frame. I made the textblock with thick watercolor paper that I like to use for watercolor painting. How was the model adapted to accommodate limits on production techniques, lack of materials? I used two pieces of leather instead of alum tawed due to how expensive alum tawed would have been. 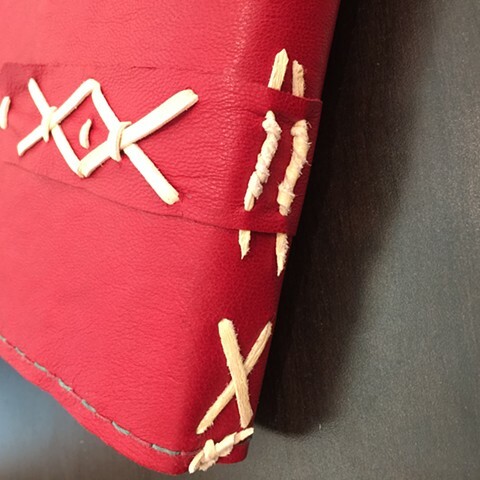 Because of this, I used a red leather instead of naturally dying it for the front. 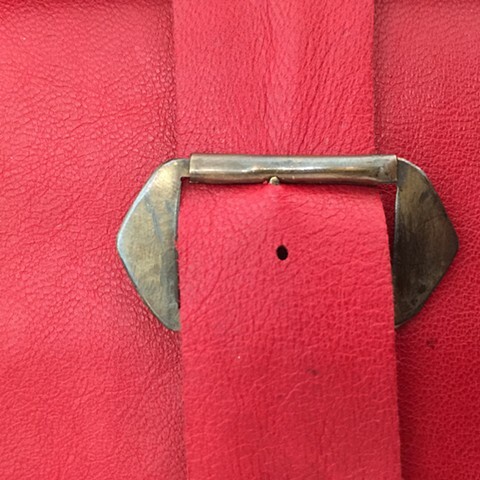 The red leather is split but the original had two layers of a thicker material. I naturally dyed the interior alum tawed thongs with lac and brazilwood-- which may have been a combo used for the exterior. The model is a bit smaller than the original because I didn’t accommodate for trimming it down after gluing the leather pieces together. 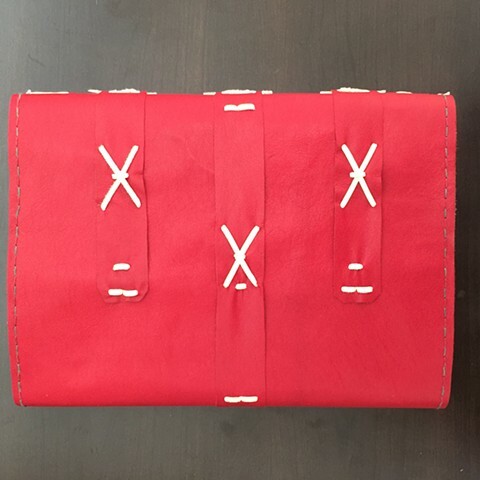 The leather needed to be about 1-1.5” longer-- the front flap doesn’t wrap around the front as much as I would have liked and was only able to do one satire “x” tacket instead of two on the flap. Interior portfolio is made of a synthetic parchment instead of actual parchment. I used a thick watercolor paper instead of a thinner paper for the textblock because I want to use this as a painting book. What did I learn in the process of researching/creating this historical book structure? I did quite a bit of research and planning for this model before starting the binding process. 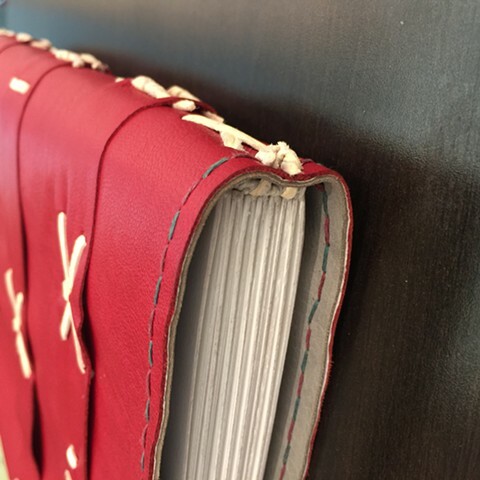 Going in with a well thought out plan made the binding process much more relaxed and I bumped into fewer issues than I expected. I learned how to sew through leather, make tackets, and a buckle!